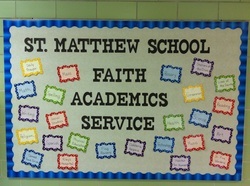 St. Matthew School has been educating children in Mt. Vernon, Indiana since 1867. We serve children in preschool through 5th grade and are open to families of all faiths. About 50% of our students are Catholic and 50% are non-Catholic. St. Matthew School is accredited by the State of Indiana. St. Matthew School received the honor of being named a "Grade A" school for the past five years. We have also been named a "Four Star School" three times. Our teachers and staff are fully licensed. Our student-teacher ratio is 9:1. Teachers use differentiated instruction to meet the needs of each student. They also integrate technology through the use of Promethean boards, document cameras, and iPads in addition to the mini lab in each classroom and the computer lab. The K-5 curriculum consists of Art, Computers/Technology, Handwriting, Health, Language Arts (grammar, reading, spelling, and writing), Math, Music, Physical Education, Religion, Science, Social Studies, and Spanish/Immersion Spanish. Our mascot is the Wildcat Cub. Our school colors are royal blue and white.